Marty’s Meats has been serving up food to the people of Rochester on their truck for over 2 years and Tuesday marks the opening of their brick and mortar location on Park Ave. I’ve been a fan of the food they have been creating and over the past year or so they have been stepping up their game to create some of the best sandwiches in Rochester. Chef Paul Koecheler and Marty O’Sullivan were on site Sunday for a preview meal that my wife and I attended and we had a chance to sample some of their new offerings. Before diving into what we thought about the food, let’s talk a little about the menu and what they are trying to do with the restaurant. The sandwich portion of the menu is starting off as a greatest hits from the truck including my favorite, the pastrami with mustard and sauerkraut. Instead of going through most of the sandwiches that we’ve had before, we hit the new “Meats” section that only has simple descriptions: pulled pork, brisket, chicken and pork belly/bacon. Usually these would be served with ~1/2 lb portions for a $10 price point. Both the pork belly and brisket were fatty cuts seared off nicely on the flattop to a solid crunch. Behind the crust, the meat was fall apart tender and had enough smoke to accent the richness. 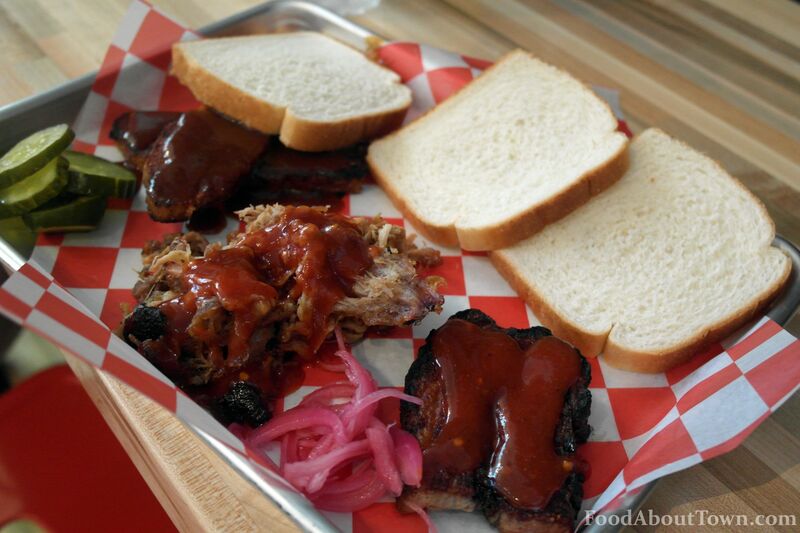 The belly was served with an A1 like spiked Marty’s BBQ sauce which was surprising and a choice I really enjoyed. The acidity helped to cut through the belly and was a combo that I’d mever tried before. The smoked pulled pork and brisket came with the straight BBQ sauce and although it is a touch on the sweet side it suits the meats well. The brisket ranks among the best I’ve had in Rochester so keep an eye out for it. 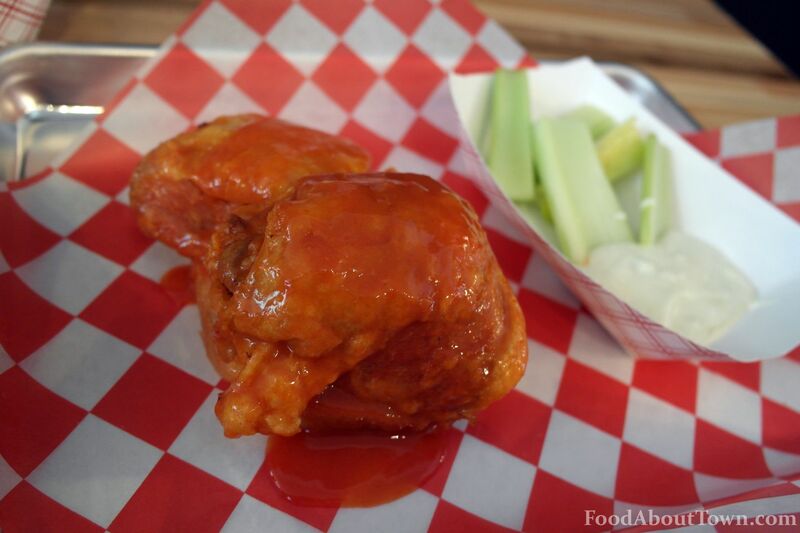 The fried chicken thigh was a smart substitution from the traditional wing cut and one I enjoyed. The skin was crisped well and the meat remained relatively tender. The bone to meat ratio is a lot better than a wing and the sauce was still basically a straight wing sauce and a good version at that. We dug right through these even as we were getting full. 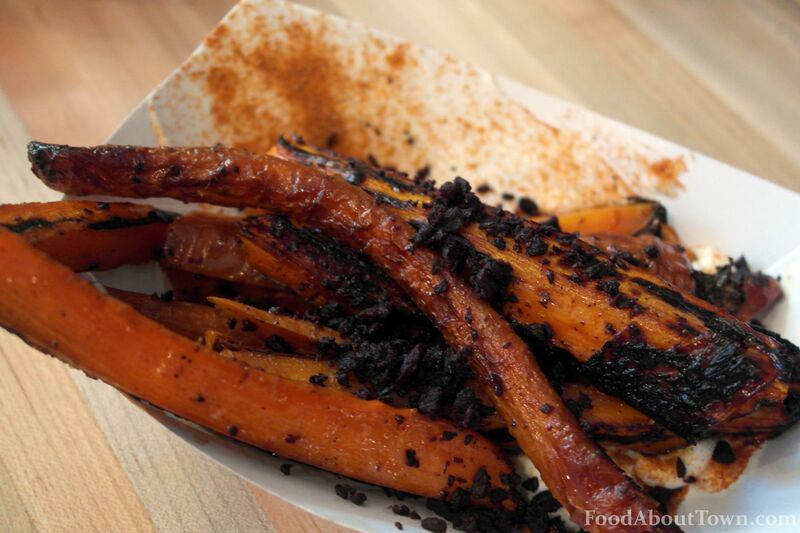 And what might have been the best thing we had was the griddled carrots with dried olives and seasoned sour cream. Hints of caramelized edges on the carrots still with some bite balanced by the briny olive. The BBQ seasoning mixed with the sour cream both smooths out the whole dish and give it a touch of spice pop. The sides run $5 and will be rotating as the seasons change. 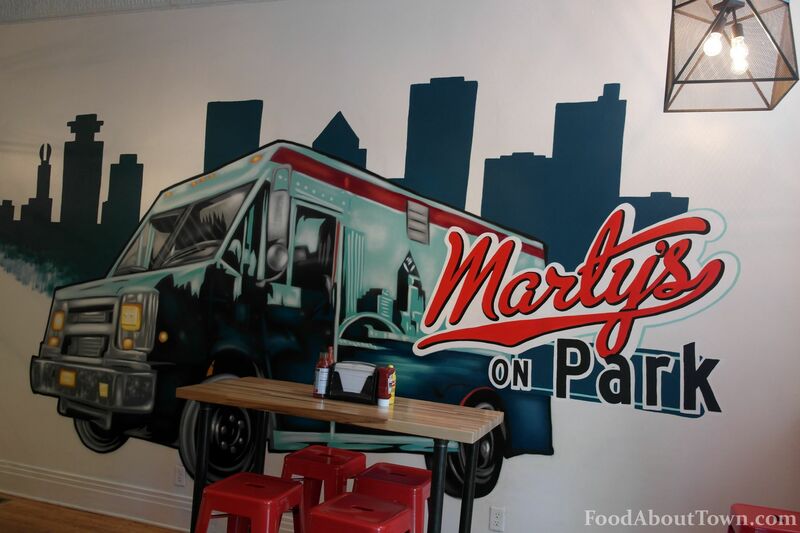 The new location of Marty’s Meats stood up to the high expectations that I had. The turnaround from the old Cheese Masters was really well done with stainless steel accented by beautiful wood counters and an open kitchen with modern hardware. The street art style mural shown above was the focus point of the room and it felt completely like a new place. 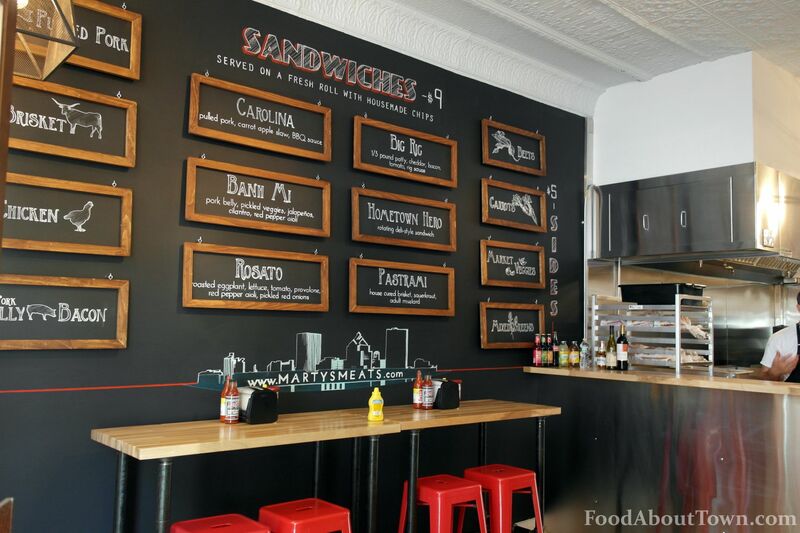 Fast casual service with elevated food on Park Ave. What’s not to like? 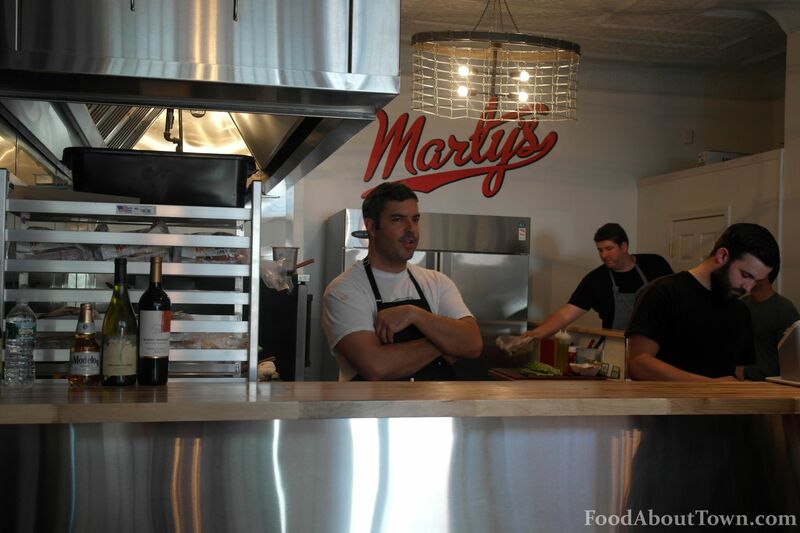 I’m really happy for the Marty’s crew and I can’t wait to see what new creations are in store. Also keep an eye out for potential sit down style dinners once everything gets settled. Welcome to Park Ave!